Our clinic offers a progressive new approach to veterinary care. Our Wellness Plans embrace and focus on preventative medicine based on the specific life-stage of your pet. Pet Emergency? Call us right away at (843) 553-7011! If you live in Goose Creek or the surrounding areas and need a trusted veterinarian to care for your pets – look no further. Our doctors are licensed SC veterinarians, treating all types of pets. Your pets’ health and well-being are very important to us, and we take every possible measure to give them the care they deserve. 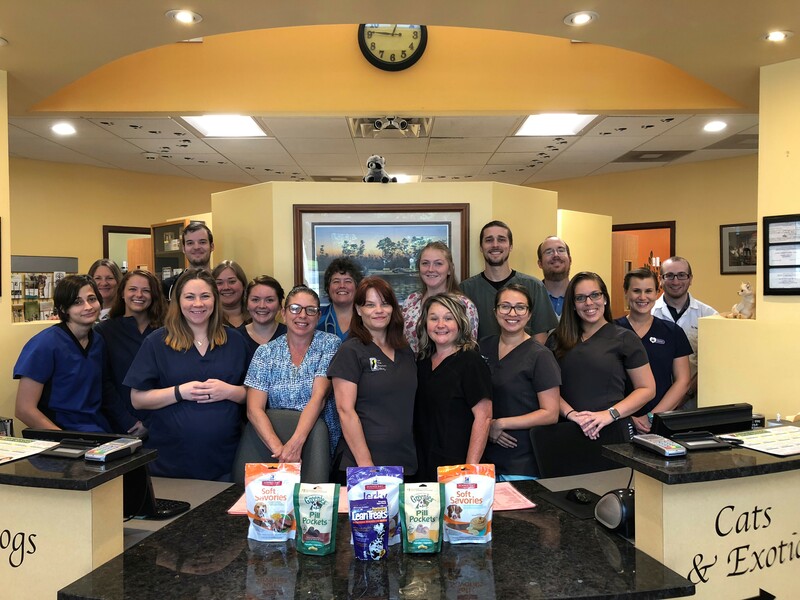 Goose Creek Veterinary Clinic is a full-service animal hospital and welcomes both emergency treatment cases as well as pets in need of routine medical, surgical, and dental care. Our doctors have years of experience treating serious conditions and offering exemplary pet wellness care. Beyond first-rate pet care, we provide a comfortable, child-friendly, and calm office, so your pet can relax in the lobby and look forward to meeting one of our friendly veterinarians. The best veterinary care for animals is ongoing nutrition and problem prevention, so, becoming knowledgeable about preventative pet care is essential to the continuing success of your animal’s health. If you have any questions, please call (843) 553-7011 or email us and we'll get back to you promptly. Our office is easily accessible -- just check out the map below! We also welcome you to subscribe to our newsletter, which is created especially for Goose Creek pet owners. At Goose Creek Veterinary Clinic, we treat your pets like the valued family members they are. After graduating from Clemson and then the Univ. of Georgia Veterinary School, she studied a variety of species including exotics and fishes. She did several externships while in school that included working at UC Davis in the exotics division and at the Monterey Bay Aquarium in California. After working in private practice for several years she purchased the clinic in 1997. She's very interested in surgery, internal medicine & dentistry and has taken advanced training in ultrasound & surgery. She is also a member of the American Association of Feline Practitioners (AAFP). Dr. Lerma attended the University of Tennessee and graduated from the College of Veterinary Medicine in 2004. He has been an associate veterinarian at Goose Creek Veterinary Clinic since 2006, focusing on our canine and feline patients. Dr. Lerma enjoys internal medicine, ultrasonography, and dentistry. He has taken extensive extra training and education in the last couple of years in both abdominal ultrasound and dental surgery. Dr. Tim Sullivan is the newest addition to the GCVC family. He attended Mississippi State University, College of Veterinary medicine where he was very active in several organizations such as the Student Chapter of the Disaster Animal Response Team (SCDART). Dr. Sullivan had additional training in dentistry, anesthesiology, and preventative medicine. Preventative medicine, he believes, is key to our pets health. It enables us, as veterinary professionals to diagnose potential health concerns ear. Dr. Daniel Westphal is the newest addition to the GCVC family. He graduated from the Virginia-Maryland College of Veterinary Medicine in 2017 following an undergraduate degree in biology from the University of Illinois. He was a small animal tracker in veterinary school, specializing in canine and feline medicine. He has an interest in preventative and internal medicine. Whenever he’s not at the clinic, Dr. Westphal enjoys exploring the outdoors and watching live music. Kyle joined our team in 2015 with many years of experience from a veterinary clinic in Sumter, SC. He graduated from Trident Technical College with an Associates in Commercial Graphics-Photography in 2014. He is an avid photographer and graphic designer. In his spare time he loves to travel and does at every opportunity. Her is an active member of the Veterinary Hospital Managers Association (VHMA) and The Society for Human Resource Management (SHRM). Krystal joined our team with ten years of experience. She graduated from Trident Technological College in 2003 with an Associates in Veterinary Technology. She loves to spend time on the boat with her husband, son Ryder and daughter Paislee. She attends bike week every year, and enjoys riding in her free time. She loves to be adventurous and go mudding with 4-wheelers on the weekends along with anything outdoors. She is the mommy of several fur babies which include one cat and three dogs. Tracy joined our team in 2016. She is happily married and has 2 fur babies. Working with animals has always been her passion & in her free time she enjoys spending time with her family and friends. Carmin is a Licensed Veterinary Technician. She received her schooling and degree from Stautzenberger College in Brecksville, Ohio. She enjoys hiking, shooting and being in nature. She currently has 2 chihuahuas named Lily and Speck. Carmin has been a part of our team since 2017. Karissa joined our team in December 2017. She has several fur babies: 3 black and white cats and a German Shepherd. In her free time she enjoys listening to music, reading, and learning new things. If you have any good book or music suggestions, she would be glad to hear them. If you want to know her topic of the month, just ask! Miranda joined our team in July 2018 after moving from the southernmost point in Key West Florida. She is married with 3 fur babies, a basset hound named Toby and 2 cats named Leo and Romeo. In her free time she enjoys hunting for deals at TJ Maxx, capturing Charleston’s unique charm with her camera, sprucing up her garden, soaking up the sunshine, and cheering on her GA Bulldogs. Kiersten joined our team in January 2019. She is from Seattle Washington. She loves any size cat, big or small. In her free time, she enjoys spending time with her family and friends. She relishes her job and loves the chance to work with animals every day. Cody joined our team in 2018. He is the dad of 7 fur-babies and 6 reptiles. He enjoys spending time with family and friends & in his free time you can find him enjoying the outdoors or at the beach. Tiffany joined our team in September 2017. She has 4 fur babies, 3 dogs named Axel, Leah and Buddy and 1 cat named Tobias. She has always had a love and passion for animals since she was a little girl. Now she gets to work with them and help care for them on a daily basis. Shannon has been apart of our team since March of 2007. She is married, has 2 wonderful children and a wonderful grand-daughter. Her family also includes 3 dogs (Ricky, Cleopatra and Gemma), 1 cat named Cali and 2 sugar gliders (Chuy and Turtle). In her spare time she enjoys going fishing, camping, hanging out with her family. In a more relaxed setting she enjoys reading a good book at the beach. Tiffany joined our team in June 2015. She has 2 human babies (Hayleigh and Raymond) and 4 fur babies (Spooks, Selina, Ivy and Shelby). In her free time she enjoys spending time soaking up the sun at the beach. Elisa graduated from Winthrop University in 2015 with a Bachelors degree in Biology. She has worked in veterinary care since 2016 and is the proud cat mom to 3 kitties: Sweeney, Sparrow, and Gilbert. "GCVC has been taking care of my fur babies, whether they bark or meow, for close to a decade. They have been with me through the joy of adoption to the pain of loss and all of the stages in between. As long as I am within driving distance, my babies will not be going anywhere else. You can trust them with your little ones." "Got in for a same day appointment and even though I was 10 minutes late they were still super amazing and able to see us same day. We even got treatment done on my sons hamster all before we left!! Awesome service and staff." "Our fur babies love Dr Brown and Dr Westfall! And we love that they are always willing to help us out when Cat Mandu has a recurring issue that they know when I call they can just give me the meds instead of making us bring the boy in to see them! Wonderful for us too is that they are right around the corner!"